I had the great good fortune of having grown up just outside Washington, DC, where on a fifth grade class trip to the Folger Library and Theater, I fell in love with Shakespeare. This experience, along with a few visits to see his plays performed at nearby Wolftrap, made me think I might go into theater. Instead I became a student of literature, but somehow, my love of Shakespeare on the stage didn’t translate to the page until college. While studying for a sophomore-level “Histories & Tragedies” class, I sat, my Norton Shakespeare open, in front of the TV—reading along while watching Kenneth Branagh’s stylish film adaptation of Hamlet, which draws on the entire text of the play. Only then came the epiphany: this language is music and magic. The rhythmic beauty, depths of feeling, humor broad and incisive, extraordinary range of human types.... If we are to believe pre-eminent Shakespeare scholar Harold Bloom, Shakespeare invented modern humanity. If this seems to go too far, he at least captured human complexity with greater inventive skill than any English writer before him, and possibly after. Is there any shame in finally “getting” Shakespeare’s language from the movies? None at all. 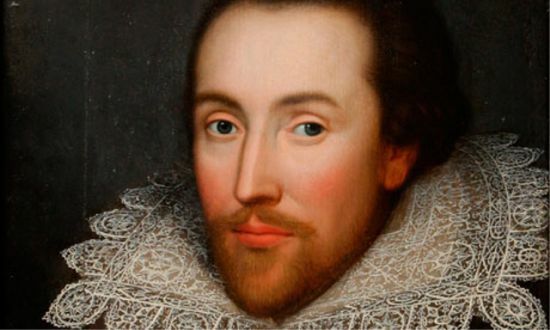 One of the most excellent qualities of the Bard’s work—among so many reasons it endures—is its seemingly endless adaptability to every possible period, cultural context, and medium. While engagement with any of the innumerable Shakespeare adaptations and performances promises reward, there’s little that enhances appreciation of the Bard’s work more than reading it under the tutelage of a trained scholar in the playwright’s Elizabethan language and history. Universal though he may be, Shakespeare wrote his plays in a particular time and place, under specific influences and working conditions. If you have not had the pleasure of studying the plays in a college setting—or if your memories of those long-ago English classes have faded—we offer a number of excellent free online courses from some of the finest universities. See a list below, all of which appear in our list of Free Online Literature Courses, part of our larger list of 875 Free Online Courses. Also, speaking of the Folger, that venerable institution has just released all of Shakespeare’s plays in free, searchable online texts based on their highly-regarded scholarly print editions. And though some beg to differ, I still say you can’t go wrong with Branagh. I have been listening to William Flesch’s lessons and find them interesting. I cannot get the site for Ralph Williams to work. Does anyone else have a problem with Mr. Williams?